The company that runs the haunted attraction has operated in the Nashville area for the past eight years, and has not reported any other security issues or serious injuries in that time. NASHVILLE -- James "Jay" Yochim loves haunted houses — at least, he did, until this week. A visit to a Madison attraction this October left Yochim with a stab wound to the arm and Metro Nashville Police at a "dead end" in their investigation, according to department spokeswoman Kris Mumford. An employee of the haunted house has been placed on leave while investigation continues, a spokesperson for Nashville Nightmare said. Yochim, 29, and three friends on Friday night headed up to Nashville Nightmare in Madison, a horror-thrill campus with four separate "haunted houses," an escape room, carnival games, food vendors and more. "Halloween is, ask any of my friends, my favorite time of year," Yochim said. "I go all out for decorating. I watch a horror movie every day. I get really excited about going to haunted houses." He was especially excited about Nashville Nightmare, since he previously enjoyed scary nights at other locations run by the production company, Thirteenth Floor Attractions, in Texas. Before the night took a turn for the truly macabre, Yochim and his friends, he said, had a fantastic time in the attractions. "We'd had so much fun, we were jumping around," he said. There were character actors in a courtyard space near the escape game building and carnival games where the group was standing. Yochim's group started laughing and joking with someone they thought was a cast member. At one point, he handed Yochim's friend a knife and told her to stab him with it, as retribution for a teasing joke. "Keep in mind, we'd been chased by chainsaws, holding other weapons, all kinds of stuff all night, and it was all fake," he said. "So she stabs at me with it, and everything got really black." When Yochim looked down, he saw blood pouring from a knife wound that went clear through his forearm. "The thing I remember," he said, "is the guy who gave it to her kind of freaking out and saying things like, 'Oh, I didn't know my knife was that sharp. I didn't know. I'm so sorry.'" Everything is a little hazy for Yochim around then, but he remembers coming to lying on a table with cast members trying to keep him conscious, and his friend "bawling" next to him. "No one wants to stab their friend," he said. "I've been stabbed and I still can't even imagine what it's like to accidentally hurt your friend like that." To enter the attraction, each visitor must go through metal detectors, which Yochim said were "very thorough and attentive." No weapons are allowed inside the attraction. "As we have continued to review the information, we believe that an employee was involved in some way, and he has been placed on leave until we can determine his involvement," Nashville Nightmare organizers said in an emailed statement Tuesday evening. "We are going over all of our safety protocols with all of our staff again, as the safety and security of all of our patrons is always our main concern." 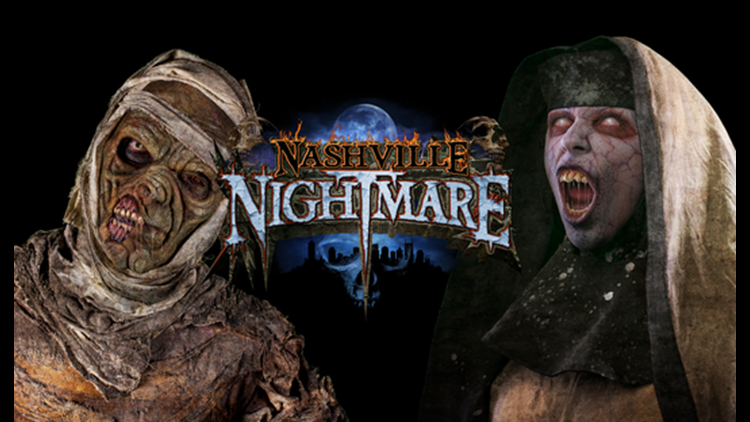 "We have enjoyed a good reputation in this community, and our goal is always to host a festive, safe and professionally run Halloween event," Nashville Nightmare's statement indicated. He was lucky, in a way, that the path of the wound missed any major arteries, bones or tendons in his arm, although his doctor is still carefully monitoring the healing process. He was taken by ambulance to the ER at Tristar Skyline in Madison. The wound required nine stitches. Yochim and his friends gave statements to police at the hospital. The police report includes the same narrative Yochim shared in an interview with the USA TODAY Network-Tennessee. The statement from Nashville Nightmare said the company has not been contacted by police.